Folk Dancing, Folk Music, History, Culture, Art, and Adventure! ★ Athens, Nauplia, Sparta, Olympia, Delphi, Meteora, Mycenae, and Epidaurus ! ★ Folk dancing with local Greek teachers ! ★ International folk dancing with Jim Gold! seeing for land tour, all breakfasts and dinners (except Athens). *Download Greece itinerary pdf. With pictures. No pictures. Departure from JFK airport in New York City. Day 2-3: Sunday-Monday, October 11-12: Arrive in Athens. ”The gods could have lived anywhere: They chose Greece.” Transfer to Herodion Hotel. Explore ancient and modern city of Athens; visit the Royal Palace, Temple of Olympian Zeus, Acropolis, and Omonia Square. 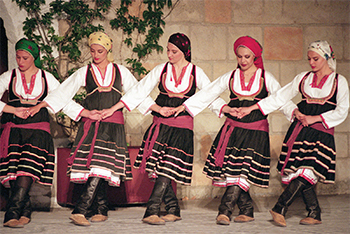 Greek folk dancing. Overnights at Herodion Hotel. See Corinthian canal, archaeological site of Mycenae, and the theater at Epidaurus. On to Nauplia, Sparta, and the Byzantine site of Mistra. Dinners, Folk dancing with local Naupflia dancers. Overnights in Nauplia: Agamemnon Hotel. Drive through central Peloponnese passing Megalopolis and Tripolis. Tour of historic Olympia. Dinner, folk dancing. Overnight in Olympia: Amalia hotel. Overnight in Delphi: Amalia hotel. Morning visit to Delphi museum. Drive through Arachova, Lamia, and Trikala. Arrive in Kalambaka. 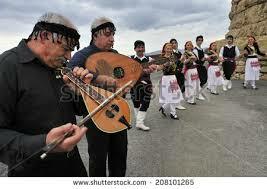 Dinner, folk dancing, Overnight in Kalambaka: Amalia hotel. Visit breathtaking cliff monasteries of Meteora. Rising from gigantic rocks, they appear as nature’s gift to the pious who chose solitude and a life of worship. Lunch and Greek folk dancing in a local Kastraki restaurant. Return to Athens, passing through historic Thermopyle. Overnight: Herodion Hotel. FOUR DAY GREEK ISLAND CRUISE! Leave Athens and sail from the harbor of Piraeus to Mykonos. Visit Kusadasi in Turkey. Optional excursion to the ancient city of Ephesus, best preserved Greco-Roman city in the world. Bazaar shopping tour of Kusadasi led by Jim. Sail to the island of Patmos where St. John wrote the Book of Revelation. Sail to Rhodes. Explore the medieval city. Optional excursion to Lindos with ancient Acropolis and breath-taking views. Walking tour of Rhodes led by Jim. Visit Heraklion, capital of Crete. Optional excursion to the Palace of Knossos. Sail to Santorini, home of legendary kingdom of Atlantis. Sail to Piraeus. Transfer to airport for flight back home. Included are accommodations and daily breakfasts at the Aressana Hotel. Saturday night or Sunday morning flight to Athens, then flight home. refundable until June30th. Single Supplement: $795. Santorini single supplement: 395 app. Additional charges: $145 hotel taxes and service. Port taxes of $148 app. Gratuities and cruise visits to archeological sites are not included in the price. Santorini extension participants forfeit cost of last night of cruise (including accommodation, dinner and breakfast.) Gratuities, cruise visits to archeological sites, and Lee’s pre-arranged visits with local folk dance groups, are not included in the price.. Program subject to change without notice. Cancellations 90 days prior to departure: Refund: 50% of total price. Less than 60 days: No refund. Travel insurance recommended. Total balance due July 1, 2020. 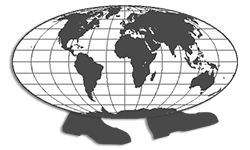 Rates: Tour rates are subject to change in the event of currency fluctuations or increase in costs. Inclusive tour rates are per person in double occupancy. In case of computer or human billing errors, we reserve the right to reinvoice clients with corrected billing.